It's a square base card with a band of pearlised butterfly paper down the side. The stamp is from La Blanche inked in brilliance and with a little bit of glitter and matted on silver mirri. A peeloff sentiment and decoration and pearls along the punched edge. Maybe not oooh and ahhhhh to you, but I think it's very vintage lovely! Love those pearls too, BTY! 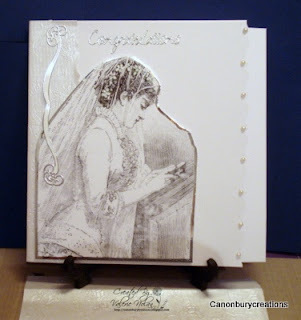 What a truly beautiful vintage card excellent job!!! !